Product information "Monitoring System 50 - Bundle Temperature and Humidity"
The environmental factor humidity (RH) plays a significant role in many mission-critical infra- structures in today’s world where these systems are highly sensitive and can be very vulnerable to failure due to sudden changes in their installed environments. For example low humidity levels can cause static charges which can be disastrous for computing equipment in server rooms and data centers, possibly causing catastrophic failures. Another example would be the presence of excessive humidity which can cause the formation of condensation. These often unnoticed or unseen microscopic water particles can be present on your server’s mainboards and most likely would dead to short circuits or other severe damage to your critical equipment. Therefore, it is highly useful to measure relative humidity consistently and permanently within your sensitive areas and to be alerted immediately if your humidity levels are in danger of causing irreversible damage to your critical infrastructures. The installation of humidity sensors also enables the monitoring and control of your installed ventilation and air conditioning systems. The Didactum humidity sensor can ensure that your important HVAC equipment is functioning properly and is providing the proper humidity levels. The installation of Didactum`s relative humidity sensor is simple. You just have to connect the included patch cable from the humidity sensor to the network enabled Didactum monitoring device. On request you can extend this humidity sensor up to 50 meters from the Didactum monitoring unit. Per the Auto-Sense function of this sensor it is automatically detected and displayed in Didactum`s easy-to-use multilingual web GUI. 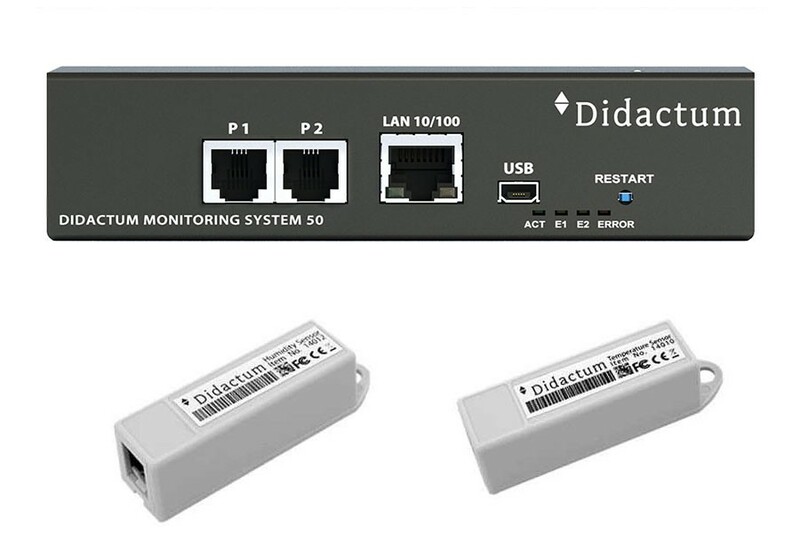 Didactum`s humidity sensor is supplied with 2 meters patch cable and mounting hardware (screws / mounting tape). Related links to "Monitoring System 50 - Bundle Temperature and Humidity"
Connection Humidity sensor contains RJ-12 jack and is connected to an analog input of any system unit. Determination of type of sensor and connection occur automatically. Customer evaluation for "Monitoring System 50 - Bundle Temperature and Humidity"